Welsh fly-half Owen Williams has been named Leicester Tigers young player of the season. Williams took the award after a string of starring roles in the Aviva English Premiership after moving from Scarlets last summer. He has also has been shortlisted for the Aviva Premiership discovery of the season award. 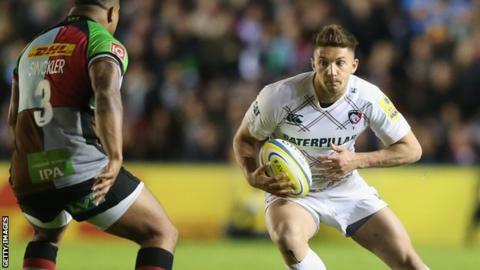 The 22-year-old Williams has edged ahead of England's Toby Flood as the Tigers' first-choice fly-half. Williams has made 13 appearances for the Tigers this season, including nine starts, and has kicked 115 points. His performances have been so impressive that former Wales fly-half Phil Bennett has tipped Williams to play for Wales on their summer tour to South Africa in June. Bennett has been disappointed with recent performances of Rhys Priestland and Dan Biggar, the current first-choice number 10, in the Pro12 Welsh derbies at the Millennium Stadium. And Bennett said Wales Under-20s cap Williams has moved ahead of his rivals for the jersey. The shortlist for the Land Rover Discovery of the Season award includes Jamie Elliott (Northampton Saints), George Ford (Bath Rugby), Elliott Stooke (Gloucester Rugby), Billy Vunipola (Saracens) and Anthony Watson (Bath Rugby).